Richmond, VA&apos;s Need Supply Co. is a one-stop shop for most menswear fans, not just because it carries great and wearable clothes, but it gets ridiculous exclusives. The latest in the shop&apos;s expressly-stocked line-up is a pair of unlined Dover bluchers from Alden entitled the "Patterson." 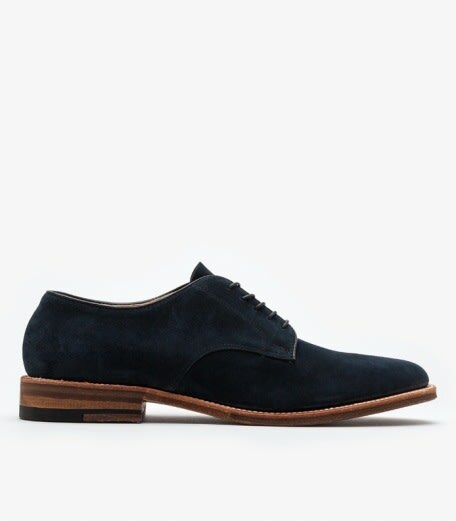 Offered in navy suede, the simplicity of this shoe&apos;s plain-front is way in, because anything brogued-up is way out. But, you knew that already. Also, this shoe&apos;s unlined nature makes it ideal for when the weather heats up. You could even rock these instead of a pair of canvas sneakers this July if you want look put together. The only takeaway is that these cost $490, but that&apos;s what quality&apos;s worth these days, right?